Passion comes in many forms. Mr. Carlo Riva exhibited his passion through the design of the sleek, wooden power boats that graced the planet’s finest lakes from 1950. In 1998, the Riva Historical Society was founded with the aim of locating and aiding in the conservation and restoration of the magnificent Riva boats. This year again, Frederique Constant is delighted to announce their continuing partnership with the Riva Historical Society. 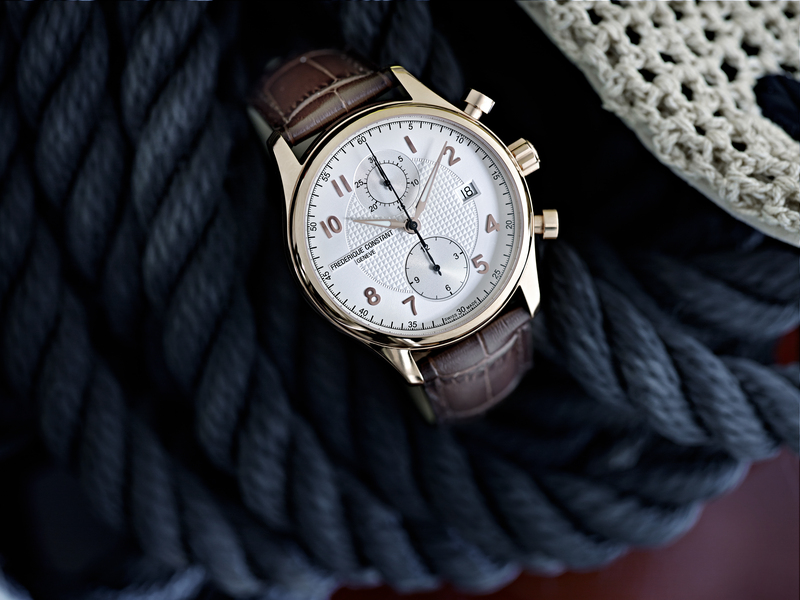 As a salute to the iconic Riva water craft and the passion that spawned them, Frederique Constant introduces the 2014 limited edition Runabout Chronograph Automatic Collection. The new range features two models. Only 2,888 of each will be produced. Both are powered by the ultra-precise FC-393 automatic chronograph movement, offering 28,800 beats per hour, 25 jewels and an appreciated 46-hour power reserve. Functions include hours, minutes, seconds, date and a mechanical chronograph. The date window is located at the 3 o’clock positon. If you want to wear your new Chronograph Automatic while you’re out on the waves, you can, this model is water resistant to 50 metres. With a case diameter of 42mm, the dial is protected by a diamond-hard convex sapphire crystal, and both models feature the exceptionally popular see-through case back, allowing owners to view the internal workings of this mechanical marvel. As an acknowledgement of the work they do and the passion with which they do it, the Riva Historical Society flag is etched into the case back glass. The FC-393RM5B4 comes with a striking rose gold plated case, with a wonderfully contrasting silver dial featuring a guilloche decoration in the centre. The hour and minute hands are luminous white. The Arabic numerals are finished in rose gold and hand-applied. A luxurious crococalf leather strap in dark brown with a folding buckle completes the stylish and timeless look of this model. The FC-393RM5B6 is the next in the new range. It features a gleaming, hand polished stainless steel case. The lustrous silver dial has the guilloche decoration at the centre, while the hand-applied indexes are pearl black Arabic numerals. This model is presented with a deep blue crococalf strap with white stitching and a folding buckle. The combination of colours, textures and styles all combine to give an appearance that is unquestionably modern yet undeniably timeless. Each of the new Runabout Chronograph Automatics will be delivered in a specially designed gift box, complete with a delightful miniature replica of a wooden Runabout. Given the company’s own slogan, “Live your passion,” Frederique Constant admires and respects the driving force behind the Riva Historical Society. The new Runabout Chronograph Automatic Collection is a salute to creative passion in all its forms, in the past, the present and in the years still to come. 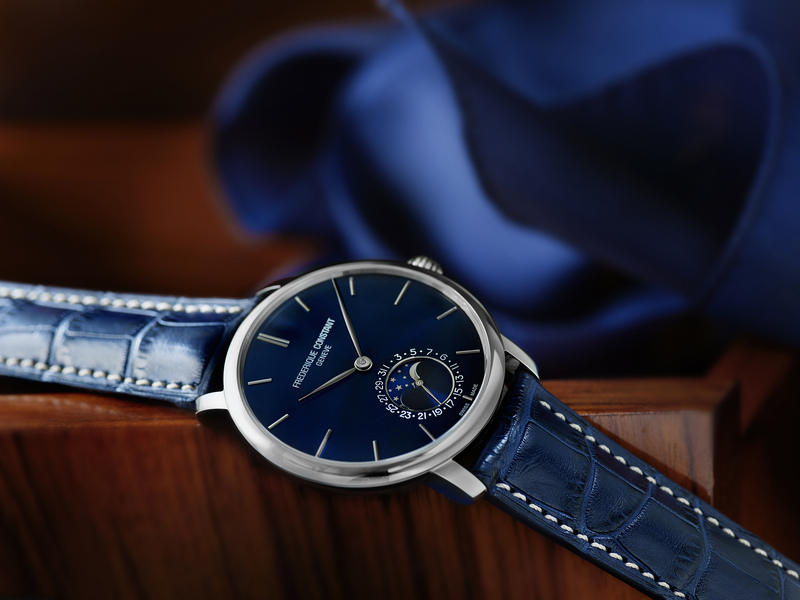 For more information on the new Runabout Collection, please visit our website, www.frederique-constant.com, or contact us directly. You can email Mrs. Yasmina Pedrini at pedrini@frederique-constant.com. Categories: Frederique Constant, Watch Blog, Watch Brands | Tags: Frederique Constant, Runabout | Permalink. 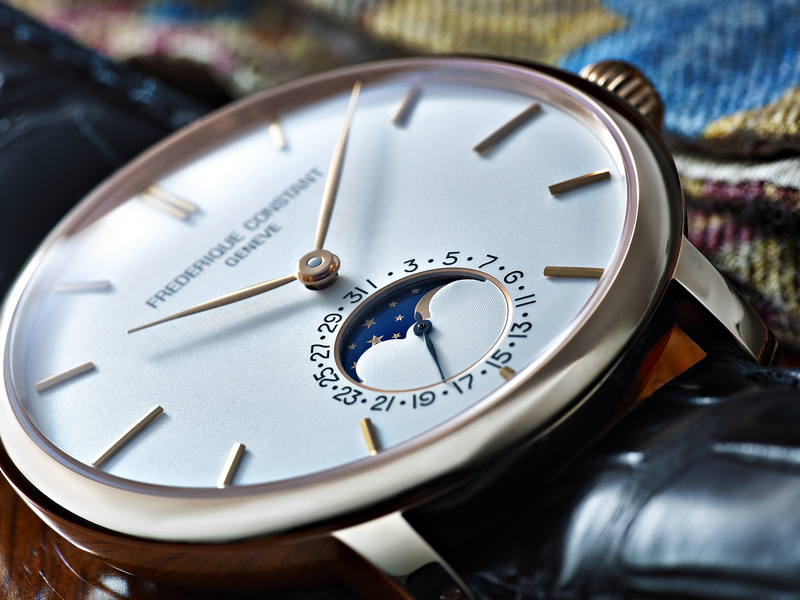 Frederique Constant are herer doing stainless straps again, this time on their beautiful Worldtimer. – We likes muchly. Categories: Frederique Constant, Watch Blog, Watch Brands | Tags: Frederique Constant, worldtimer | Permalink. Categories: Frederique Constant, Watch Blog, Watch Brands | Tags: Frederique Constant, Moonphase, slimline | Permalink. Hmmm, the watch has class then, it gets all arty farty when it talks back to me, when the sun collides with the moon indeed! Ok, I need a second look at this watch, I need to see it in the sunlight. This is a bargain basement watch from a watch maker using their own movement, as demonstrated by their lovely video below. It demands more thought. Here at Beastie Folly, you can see from our sister site AutoBeast that we like cars as much as we like watches, and one of the cars in our stable is a BMW MINI Coupé JCW and just like this watch we loved it at concept, we loved the launch pictures but frankly were left cold by the car on first site in the flesh. We could not get the car out of our heads though, with this real love /hate thing going on and a year later we had to have one. We have never looked back, we love the car and it is the best MINI we have ever owned by a country mile, so much more than just a car, it is a dancer on wheels, a delight every day. I’m thinking this watch sits in similar territory, so I need to look at one again and soon. Meanwhile, join me in a look at this smooth video from Frédérique Constant. 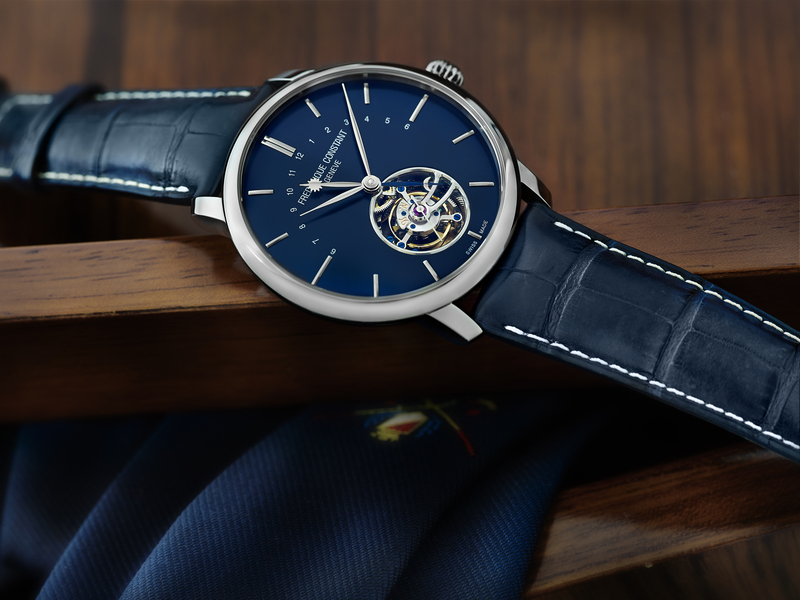 The Frédérique Constant Slimline Tourbillon Manufacture Range. Here at Beastie Folly we are big fans of Frédérique Constant and the Slimline range is a very elegant family from the manufacture. 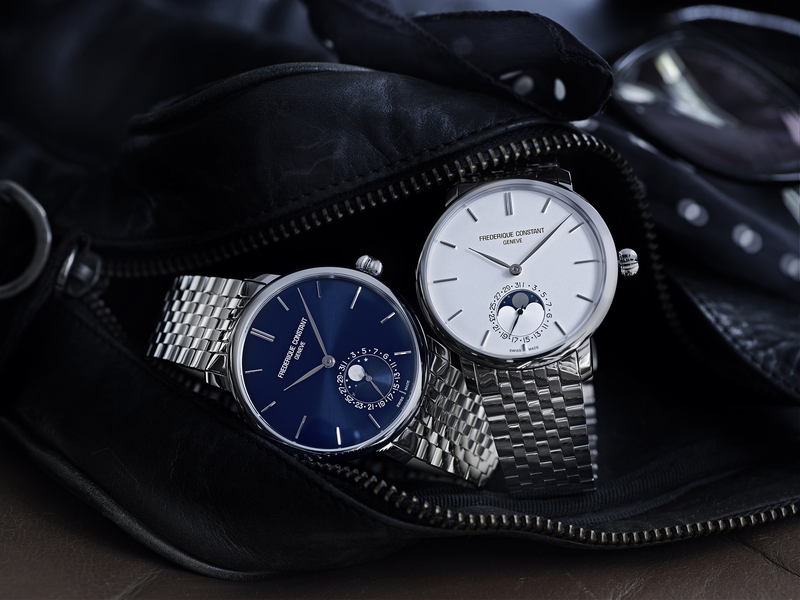 These watches first caught our eyes with the Moonphase collection and these just continue where they left off, but take it up a few notches more. Ah if only money grew on trees. Categories: Frederique Constant, Watch Blog, Watch Brands | Tags: Frederique Constant, Tourbillon | Permalink. Here at Beastie Folly we keep stumbling across new offerings at Baselworld that we really like.There have been a few retro styles, such as the Omega Bullhead and the Tudor Heritage in blue, which we have already highlighted here. 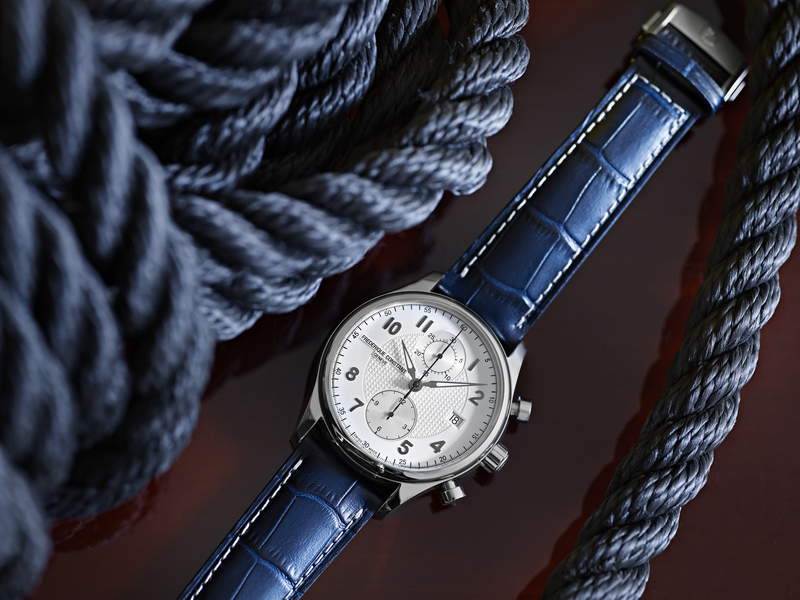 Longines have a few appealing new models and we especially like the new Hydroconquest which we will showcase shortly. Frédérique Constant have also been busy and they have sent us this press promotion which includes a stunning photoset of their new Slimline Moonphase model. It’s worth clicking the images for the full size shots they are lovely. Lady Peanut loves moonphase watches but in truth they have never grabbed me but here Frédérique Constant really have produced a well thought out model. The style is simple and elegant and this is reinforced by the slim case and the result is beautiful. I could have one in every colour! Below is the official press release text. With NASA’s Curiosity Explorer currently rambling over the surface of Mars, people on Earth are getting wonderfully detailed pictures and views of the planet that has long been the subject of folklore, myth, legend and speculation. We can see images on our television sets, videos on our computers and I-Pads, and a select few can even scan the Red Planet in real time with powerful telescopes. However, one of the glorious things about the world in which we live is that every single person on this planet can look to the sky and see the awesome, wondrous moon, without the aid of rovers, telescopes or television pictures. It doesn’t matter where you are or the circumstances in which you live; the bright, beautiful moon is available to us all. The appearance of the moon has not changed since the dawn of time. Yet it continues to inspire the same stirring emotions and passions as when the first men looked to the bright light in the night sky…and wondered. Frédérique Constant has incorporated elegant design features into the new Slimline Moonphase Manufacture that would not have looked out of place a century ago; nor will they look outdated even 100 years into the future. If the moon could make a style statement, it would be that simple beauty never goes out of style. Five new models are being introduced, and all are driven by the unique FC-705 Manufacture calibre. Each model shares a number of features, and all are presented in a unique, specially designed wooden gift box. 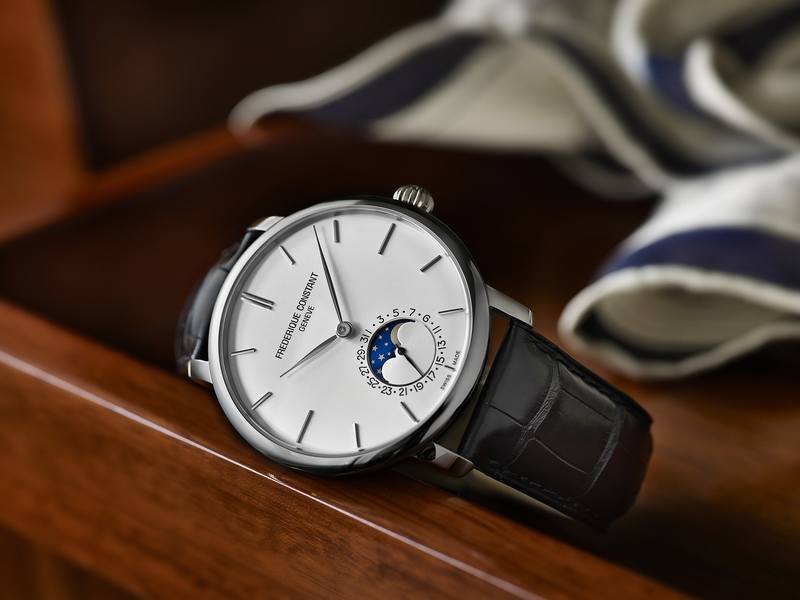 In spite of the amazing features incorporated into the new Slimline Moonphase Collection, the true genius of these watches is that each complication can be accessed through the watch’s single crown. This ability is an increasingly important feature in Frédérique Constant watches. The crown can be set into three positions. “Position 0” is selected for winding the watch. At “Position 1,” the date can be adjusted by turning the crown clockwise. Turning the crown counter clockwise allows users to adjust the moonphase. Finally, “Position 2” allows users to make adjustments to the hour and minute hands. It’s as easy as that! Other common features include the elegant slimline design and a case diameter of 42 millimetres. All models also come with the exceptionally popular convex sapphire crystal on the front and see-through case back. In addition, each dial presents the date display and moonphase at the 6 o’clock position. An incredible new technology known as “laser ablation” has been used to create an outstandingly detailed and precise image of the moon. Finally, each of the new Slimline Moonphase models comes with a 26-jewel movement, an impressive 42-hour power reserve and a Perlage and Circular Côtes de Genève decoration on the movement. 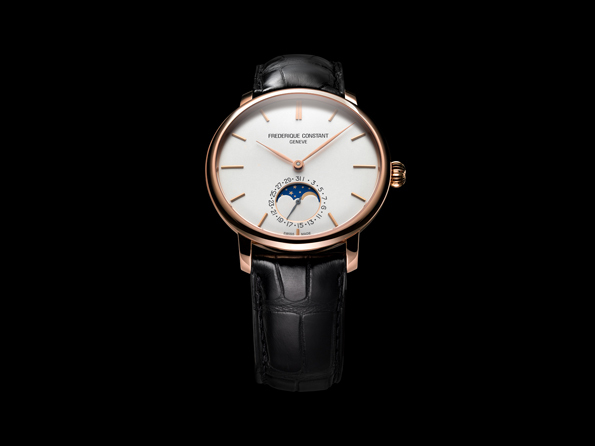 With prices starting at an incredibly low €2,695, the Slimline Moonphase offers truly exceptional value. 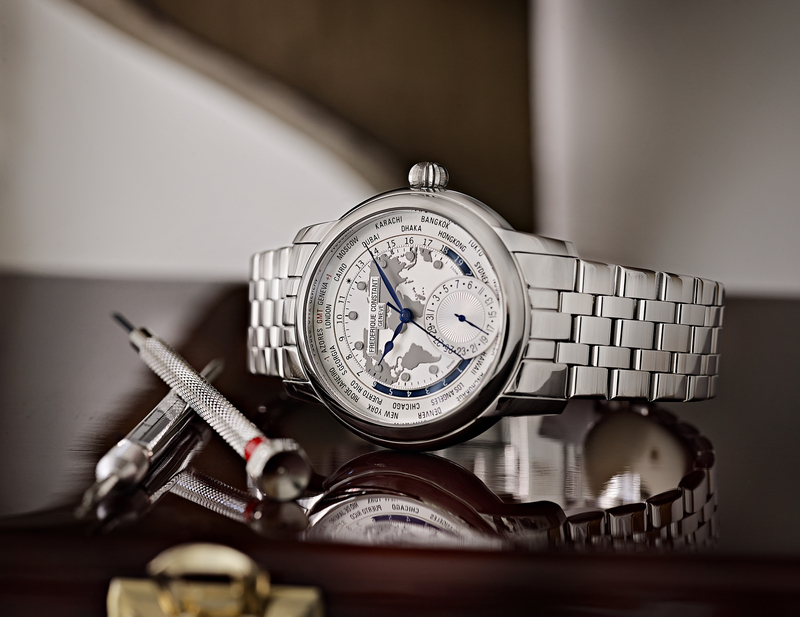 The FC-705S4S6 comes with a brilliantly polished three-part stainless steel case and a domed silver dial with lustrous, hand-applied nickel indexes and matching, hand polished nickel hands. An elegant black alligator strap with tongue buckle completes the timeless look. When only blue will do, the FC-705N4S6 is a watch owner’s dream. The second of the stainless steel models has a strikingly handsome navy blue dial, which contrasts wonderfully with the nickel indexes and hands. The alligator strap is also a striking blue, accented with off-white stitching and tongue buckle. The gleaming rose gold plated case of the FC-705V4S4 exudes understated elegance. The domed silver dial contrasts wonderfully with the rose gold plated hands and indexes, and a dark brown alligator strap stands out beautifully from the slim case. 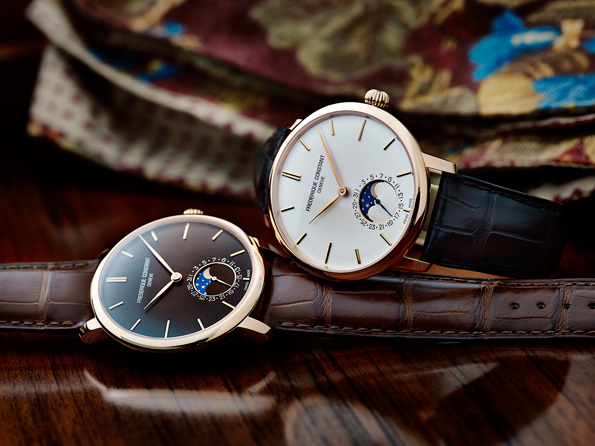 At the apex of the Slimline Moonphase range stand two models featuring solid 18 carat rose gold cases. The FC-705V4S9 is presented with a domed silver dial and hand-applied rose gold plated indexes and hands, with a dark brown alligator strap. The FC-705C4S9, on the other hand, comes with a stunning chocolate brown dial, which blends beautifully with the rose gold plated hands, indexes and dark brown alligator strap. Whether high in the sky or sitting proudly on your wrist, the moon will continue to draw admiring looks, forever. Categories: Frederique Constant, Watch Blog, We Wants Muchly | Tags: Frederique Constant, watches | Permalink.